The Companies Act, 2013 has enforced sweeping changes to the mindset of corporates and their managers alike. Codified roles and responsibilities, higher penalties, disclosures have made the position of directors more demanding. As one moves along with complying with the letter and spirit of law, there may be many questions which are not answered by the relevant section itself. A plethora of rules, notifications, case laws and standards of the ICAI and ICSI also need to be looked into. 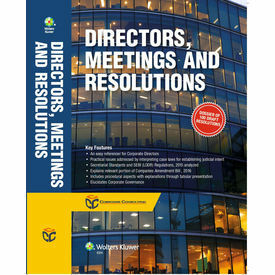 With this background, the book takes a comprehensive approach to understand the requirements of the office of a director, his roles, responsibilities, liabilities in the light of the relevant sections, decided cases and the applicable Secretarial Standards, when it comes to procedural aspects like board and committee meetings. For ready reference updated rules for appointment and management of Directors, Key Managerial Personnel, Meeting of Board and its powers, The Companies (Amendment) Bill, 2016, Exemption notification for government and private companies, SEBI (LODR) and SS-1 have been provided as appendices. To further help our readers navigate their way in the daily performance of corporate actions a separate chapter on resolutions has also been carved out.